So, you have heard that GIMP developer has released the new version of its product which often considered as one of the best alternatives to Photoshop. 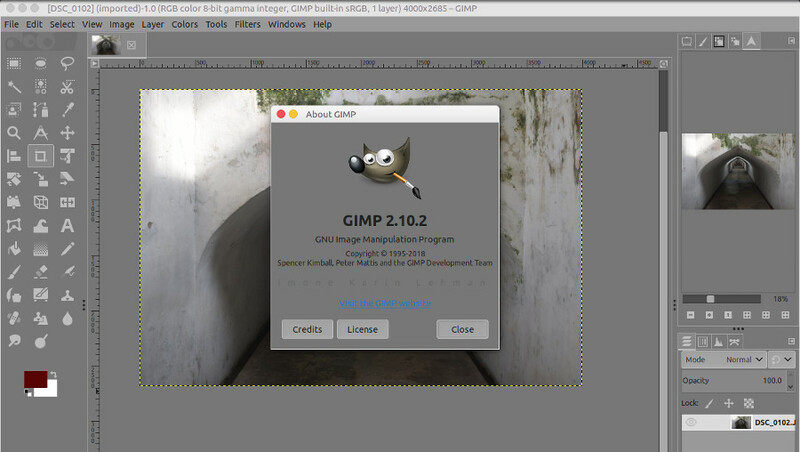 GIMP 2.10 is the first major update of GIMP since about 6 years. Many people, GIMP users in particular, are eager to see what’s new on this new version of GIMP. The developer team has summarized the notable changes of GIMP 2.10 which you can see on its official site. Unfortunately, there is no more detailed explanation included on each point. So, the best way to see what’s new on GIMP 2.10 is by giving it a try. I have installed GIMP 2.10 on my Ubuntu machine. I had to install GIMP 2.10 via Flatpack since Ubuntu hasn’t provided the latest version of GIMP on its repository. At least at the time of writing. So here is my review of GIMP 2.10. Sure, the very first thing I notice of the new GIMP is its interface. I am wondering is there a dramatic change on its interface. I never hoped so since it means that it will takes time to me to adapt with. Apparently, the answer is yes. GIMP 2.10 comes with a brand new look. It comes with a grey theme as the default theme, making it a bit similar to Photoshop at glance. But, once I explore into its tools and menus, there are no significant differences in terms of layouts. Everything is still the same so you don’t need to worry about. All instructions you read on our GIMP Tutorials channel still apply. However, there is a menu that is removed by GIMP. It’s Blend Tool. But don’t worry, there is a replacement that will give you a better experience (covered on the next point below). GIMP 2.10 offers four different themes. If the default theme doesn’t suit you, you can change it with your preferred one via the Preferences menu. By the way, GIMP 2.10 also comes with a brand new splash screen. Instead of GIMP logo like you usually see on GIMP 2.8, you will only see a word of “GIMP 2.10” with a beautiful mushroom photo as the background. One more thing, GIMP 2.10 is now fixed in single window mode. As I mentioned above, you will no longer see the Blend Tool on the GIMP 2.10 toolbox. As the replacement you will see a new tool called Gradient Tool. The function is the same. You can use this tool to apply a gradation color on the canvas. The way this tool works is also the same as Blend Tool. You can apply the gradation by clicking on a certain spot on the canvas and drag it to another one. However, there is a huge difference that I am pretty sure you will love to. It is on-canvas preview. So, when you have clicked on a certain spot on the canvas with the aim to apply a gradation and drag it to any direction within the canvas, you will see the change in real-time. You can then press the enter button on your keyboard to apply the gradient. Technically, Gradient Tool is actually not a new tool. It is just a renamed version of Blend Tool, with an improvement. There are several other new tools you will see on the Toolbox panel. Including Warp transform, Unified transform and the Handle transform tools. 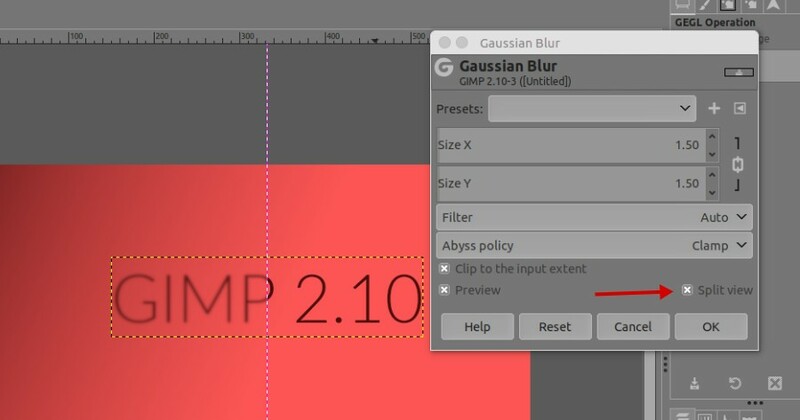 One of the exciting features offered by GIMP 2.10 is on-canvas preview. The feature is not only apply for Gradient Tool like I explained above, but also filters. When you want to apply filters like Gaussian Blur or Pixelize, you will also see the change in real-time on the canvas. It replaces the tiny preview window that we were previously limited to. More interestingly, there is also Split View option that shows the before and after effects on the same image. It is obviously a cool feature that I am pretty sure the vast majority of GIMP users will love to. Another improvement brought by GIMP 2.10 is regarding the supported image formats. On GIMP 2.8 and the older versions, you have to install addition plugin to open a WebP image. On GIMP 2.10, you can immediately open a WebP image without needing to install any new plugin. In addition to WebP, there are also other image formats that are supported by GIMP 2.10. Including OpenEXR, RGBE, and HGT. If you often use GIMP to make some adjustment over the photos you took with your camera (retouching), GIMP 2.10 comes with a new thing you will love to. Technically, you will be accessing the Colors menu more often than other menus to make some adjustments to the photos since all necessary settings are here. Say Color Balance, Hue-Saturation, Saturation and so on. There is a missed basic setting on GIMP for years. The setting I mean is Exposure. Right now, the setting is available in GIMP 2.10. Along with Shadows-Highlights. You can find those new settings on the Colors menu. Those new settings will give you a new, better experience in photo retouching. GIMP 2.8 and the older versions have no capabilities of neither reading nor editing photo metadata. This weakness has now been fixed in GIMP 2.10. There is a new option (sub-menu) under the Image menu of GIMP called “Metadata”. When you hover your mouse over this option you will see two other options: View Metadata and Edit Metadata. Without a further explanation, you must know what those options are used for. As a GIMP user, I am really thrilled with GIMP 2.10 as there are many improvements as well as new features offered. This new version brings new experience, better. However, there are some minors that need I think need to fixed on the next updates. I find that GIMP 2.10 still lack of brush types. For some people, it is probably not a big deal. But, as a user who often write tutorials brush is something important to me. I also find that GIMP 2.10 doesn’t come with a significant improvement in handling PSD file. I actually never really used GIMP to edit PSD files so it not a big deal to me. Just want to test. When I open a PSD file that contains some texts, GIMP still unable to convert the texts into layers. But overall, I think GIMP 2.10 is better than 2.8 and I have been switching from GIMP 2.18 to GIMP 2.10. GIMP 2.10 brings some new features. Different users, different features needed. If you think that color management is an important feature, GIMP 2.10 has made it a core feature now. If you often set an exposure setting on your photos, GIMP has also made it easier for you to do so via the new Exposure setting.